Measure your body fat, set fat loss goals, see exactly where the inches are coming off and track your progress. The In-Sync Diet Face-to-Face Programme is an eight week fat burning programme with two extra days at the beginning for a gentle cleanse to switch your metabolism into fat-burning mode. This programme can be undertaken within a eight week or twelve week period to make it flexible for those of you who want to go more slowly. 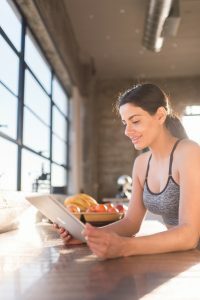 Questionnaire to help identify key reasons weight gain and what you can do to prevent this followed by a food, drink and exercise plan tailored to your goals. Six face-to-face consultations with cutting edge bioimpedence analysis to assess biomarkers of success such as reduction in fat mass, increase in total body water and increase in lean muscle tone. These include two x one hour sessions and four half hour sessions. ” I have just completed the 8 week program! What a ride, I have done various clean eating programs in my life, but this one is the best and easiest to do. I found that I can eat according to the diet rules and still eat with my husband, without making any mistakes. goals and your suitability for the programme.